BMW knows you progressive gentry love hybrids, but their 'i-car" sub-brand is a little too wacky ( i3) and flashy (i8) for many. So they're porting their hybrid tech to the ever-popular X5; which gets 313 horsepower and supposedly as much as 71 MPG as the 2016 BMW X5 xDrive40e. BMW's calling this X5 "the first plug-in hybrid production car from the BMW core brand," because it's not an "i-car," but you can charge it with the same in-house tech. Don't call the "i-cars" i-cars, by the way, I've been told the i3 and i8 are only to be referred to as BMW i-cars. You probably have Apple's lawyers to thank for that important distinction. 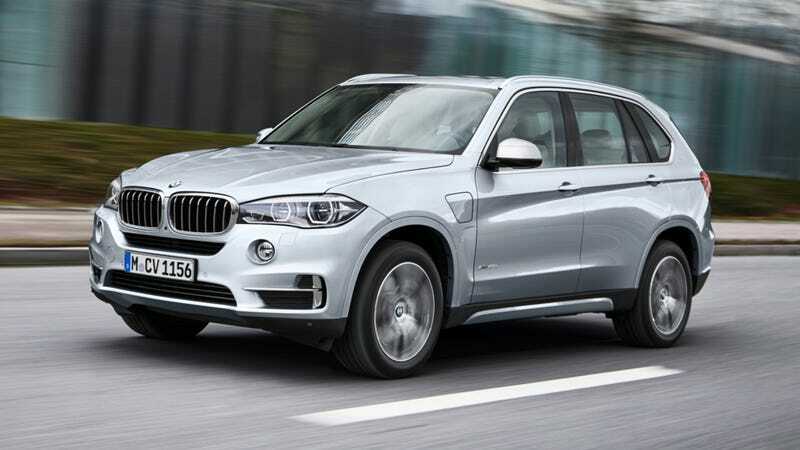 Anyway this i-X5, which is actually a xDrive40e X5, has a lot in common with a standard X5 except that it's powered by a four-cylinder turbo gas engine paired with a "synchronous" electric motor integrated into the eight-speed Steptronic transmission. In "Auto" mode the electric motor will boost the SUV's performance with 184 ft-lb of instantaneous torque. Drivers can also run in "MAX" for full-electric operation at low speed or deactivate the hybrid function altogether to recharge while rolling. When the navigation system is guiding you, the vehicle will supposedly take traffic and and road-type into account when deciding how to balance gasoline/electricity usage in "Auto" mode. You'll be able to top off the battery with any "standard domestic power socket," BMW i Wallbox, or public electric-car charging station. BMW's offering a "hybrid-specific" version of their BMW Remote app that will let you check the vehicle's charge level from your phone. This vehicle will hit the US market sometime after fall 2015, when we'll see just how close the X5 xDrive40e actually comes to BMW's ambitious economy claim.